I’m posting another recipe a little bit sooner than I usually do, because thanks to Lee over at Veggie Quest, I’ve been educated to the fact this is National Split Pea Soup Week. 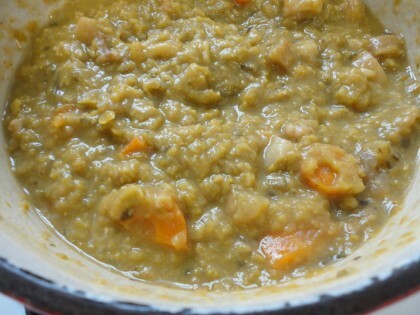 Lee has a gorgeous and delicious looking recipe for Vegetarian Curried Split Pea Soup over on her blog, which I suggest you go take a look at. (The secret ingredient is indeed inspired.) 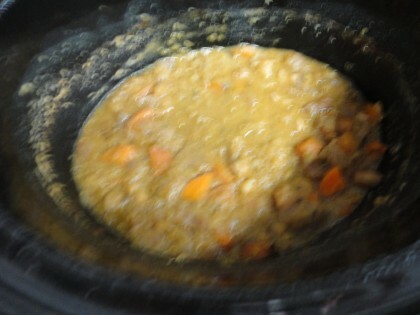 Meanwhile, in my ongoing project to honor the lentil and split pea growing region I live in, I was halfway through writing a post about some green split pea soup I made recently in the slow cooker, and thought I’d better finish it up. I have two other great vegetarian cookbook authors to thank for the inspiration for this easy tasty split pea soup. One is Anna Thomas, who wrote the classic Vegetarian Epicure back in the 70’s and more recently a wonderful book called Love Soup. The other is Kathy Hester, author of The Vegan Slow Cooker. Because of the innovative split pea soup recipes of these women, I was given the foundation to spread my own wings and come up with this version. I didn’t start out to do this. Instead I started out thinking I would make Kathy’s version. But then I wanted to use up things I had in the frig that weren’t in her recipe. I also didn’t have any of her nifty vegan buillion cubes made (recipe in The Vegan Slow Cooker). And I didn’t want to do any extra sauteing. I just wanted to throw it all in the slow cooker and forget about it. But as so often happens, the process of adding a little of this and a little of that drew me in. I wasn’t sure how it was going to turn out, but I got to use up everything I wanted to use up, and add a few more things I’d made or dried earlier in the season. I turned on the slow cooker and told myself I’d doctor it up with a little chickpea miso if it was too bland. Or some dijon mustard, like Anna Thomas suggests stirring into her stove top version before serving. But in the end I didn’t need to. It was so good I exclaimed out loud about it to myself (and Romeo) over and over, and nearly forgot to take a picture of the finished product becuase I was so busy eating it. Both Thomas and Hester use apple in their split pea soups. I had one left from an old tree half a block away, a tree I once picked baskets of apples from with my son’s help back when he was in high school. I still remember the crisp Fall morning, and how we laughed and craned our necks as Mike angled the fruit picker, hoping we wouldn’t get bombarded. I made applesauce, apple butter, and stored the rest packed in boxes full of dry maple leaves, like edible Christmas ornaments. We ate apples until February. Small, sweet and golden, they are the tastiest little apples of their kind I have ever had. This year I didn’t get to pick as many as back then. I had my hands full with a bumper crop of my own pears. But I did manage to pocket a few on our evenings walks. The house that once “owned” the tree has been torn down, but the tree is still there, waiting for someone to come sit under it and eat an apple. I had one left that was quite golden and ripe, and I wanted to use it before it turned too soft to eat. The only thing you have to have made ahead of time to do this is some Everything But the Kitchen Sink Broth. So I hope you’ve been saving your leek end and squash seeds and kale stems in the freezer. Notes: If you don’t have or can’t find dried or fresh lovage, you can omit it and the celery seed, and use a couple of stalks of celery instead. But if you can find lovage, I recommend giving it a try (you can see pictures of the plant and learn a little about it in this post). 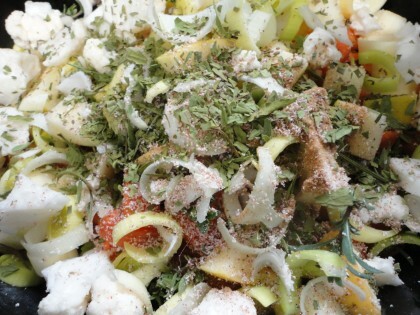 The lemon thyme and savory are nice fresh and add some distinctive flavor, but you can use dried too. So even though my pictures of it are less than spectacular, and National Split Pea week is coming to an unceremonious close, it’s never too late to enjoy this super easy hearty healthy split pea soup. Looks can be deceiving. And a week is just too short a time for anyone like me who loves split peas, yellow or green, any time of the year, any day of the week. Looks delicious! And neat about the lovage – I had never heard of it. I’ll have to look around and see if I can find some. 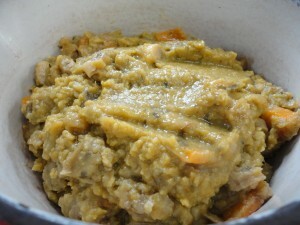 Happy Split Pea week! This recipe as always looks pretty good…must try it but it’s going to be 31 degrees celsius tomorrow…bit warm methinks for now. Hi Angela–thanks. 🙂 I always appreciate it when you comment. You are not out of line at all. I will take a look when I get a chance. Glad something else lovely reminded you of the “heart” of my blog. Maria, this looks so good! I would never have thought of apples and leeks in split pea soup, but it sounds amazing. (In fact, I just printed out the recipe.) Question, though: where does one get lovage? (It’s the first I’ve ever heard of it, too.) Do they have it at Whole Foods? Or would I need to go to a spice shop? Previous post: Slow Miracle Store Page?